Our company is a highly acclaimed Manufacturer, Supplier and Exporter of Carbon Steel Reducers in Ahmedabad, Gujarat. 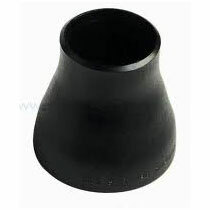 These Carbon Steel Reducers are made of the best available material and manufactured using the best possible resources. We supply and export these Carbon Steel Reducers on a large scale owing to the high demand of the product. The Carbon Steel Reducers provided by our company find many uses in industrial areas. Material :WPB A234, or according to customers requirement.